PTCL today introduced Pakistan's first Wi-Fi enabled USB with hi-link and built-in Wi-Fi technology to support both Wi-Fi and 3G connectivity. 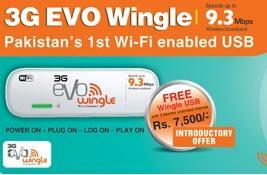 Pakistan’s first 3G USB device with built-in Wi-Fi hotspot; EVO Wingle is the most mentioned innovative Wi-Fi device that allows you to get connected to Hyper speeds of up to 9.3Mbps in 200+ cities with seamless roaming & auto switch over to EVO 3.1Mbps speeds in over 250 non-Nitro coverage areas. It allows you link ’n’ share easily through any exterior USB pwoer adaptor. Unlike Wateen USB WiMax devices, this device requires no installations, you simply need to plug in your EVO Wingle to instantly start surfing or create your Wi-Fi hotspot anywhere, anytime. You can have fun while using this device as it supports Plug & Share. EVO Wingle lets you choose the people and the devices who can access your WiFi region which is secure and password protected. This device offers universal Wi-Fi compatibility; so plug-in your EVO Wingle & get ready to mingle with multiple Wi-Fi enabled gadgets simultaneously! You can plug-in your EVO Wingle & get prepared to associate with several Wi-Fi allowed devices simultaneously as this system provides worldwide Wi-Fi compatibility. Wi-Fi gadgets in the wide range of up to 100 meters from the EVO Wingle can be attached to 3G rates of speed. PTCL is notorious for introducing high tech offers, but failing to keep up with the standards. And as we all know, customer service is awful, despite etisilat of Dubai taking over.